How Can We Miss You, Senator Franken, If You Won't Go Away? Where have you gone, Al Franken? The answer? Nowhere. As we welcome in 2018, Minnesota’s discredited junior U.S. senator is still ensconced in the U.S. Capitol like a wet hair clump in a shower drain, employed by the people of Minnesota and paid in full by American taxpayers. That is until this coming Tuesday, January 2, 2018. That’s when the comedian turned cad turned politician turned pervert has pledged to resign his seat . . . and hopefully keep his mitts off other people’s seats to boot. Yet, Mr. Franken’s pending resignation, announced nearly four weeks ago, now appears to be the longest ongoing adios in modern history. All the while, there are concerns the senator may have contracted a case of resigner’s remorse. 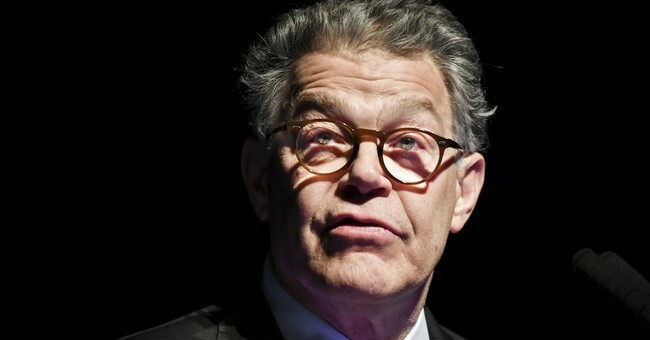 And polls show half of Land of 10,000 Lakes voters prefer Franken stay in the Senate. There is the small timing issue. According to CNN’s Chris Cizzilla, “Two things were clear after Al Franken finished his speech on the Senate floor . . . 1. He was resigning his seat by the end of the year.” Now it’s been pushed to the New Year, but what are a few days among scoundrels? Of course, no one “forced” Senator Franken to step down. He did so voluntarily. Why? Simply put, because three-quarters of Democratic Party senators demanded he resign, clearing the way for an attack on Republican sexual sleaze-balls without partisan distraction. Then, many of these same senators reportedly hugged Franken after his announcement. Now Senator Patrick Leahy (D-Vt.) claims to regret his own call for Franken’s resignation from office. In other words, Franken votes the way she desires, why should she care about how he treats women? How, exactly, does Franken treat women? Eight women have come forward to accuse him of what amounts to sexual assault, i.e. groping, unwelcome touching, aggressive and unwanted kissing, etc. And Senator Franken’s response to those charges, or lack thereof, has been a tad bizarre. “I know there are no magic words I can say to regain your trust,” Franken offered. Those statements are not a formal guilty plea, granted, but neither are they the tiniest peep about innocence. Now put yourself in Franken’s shoes. Eight women have accused you of sexually assaulting them in one way or another. If the best defense you could offer is that “some” of the many disgusting charges are “not true,” wouldn’t you resign? Or would you go down fighting, counter-allege a right-wing conspiracy, and assert your “alternative memories” as a champion of women’s rights?